The beginning of Lutheran activity in Elmira dates back to the middle of the 19th century. As early as 1840 English and Irish people settled in this district. They were closely followed by Germans who immigrated from Europe and Mennonites who came from Pennsylvania. Early historical records include such familiar names as Oswald, Esch, Steffler, Dreisinger, Braun, Schedewitz and others, who with their descendants played no small part in developing this community. The early pioneers of this district, like most others, endured many hardships and were compelled to struggle valiantly under tremendous and almost insurmountable difficulties for their livelihood. Forests had to be cleared, homes, churches and schools had to be erected and roads had to be constructed through dense forests under most primitive conditions. Due to their dauntless courage, thrift and willing sacrifices, these early settlers succeeded in realizing their hopes. Their unselfish devotion and heroic effort in building up this community were, however, not in vain. Their posterity and others are reaping the fruits of their labours. Among these first German settlers were a number of Lutherans who were loyal to their faith and who realized the necessity and value of the church. Their Lutheran consciousness, the religious training which they had received and their longing for worship constrained them to take steps in establishing a church for themselves and their children. 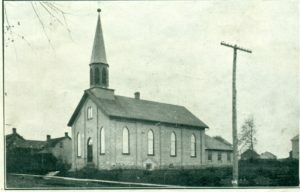 Hence in the year 1850, when the town of Elmira was but a cluster of buildings consisting of a few houses, a store and a post office which was situated at the southern limits of the town known as “Bristow’s” or “West Woolwich,” the dreams and plans of these early Lutherans were realized. An Evangelical Lutheran Congregation was organized, first known as “The North Woolwich Evangelical Lutheran Congregation” but shortly thereafter as “The St. James’ Evangelical Lutheran Congregation” which was the first organized congregation in Elmira. A parcel of land was purchased for eleven pounds and five shillings. Through the united efforts of these pioneer members, a ruggedly constructed log building became the first home of this congregation. The timber of the church was donated and all members of the congregation assisted in the construction of the building. The church furniture and pews were comparatively crude, the pews were constructed in all simplicity, slabs of logs resting on blocks of wood had to answer the purpose. Pastor Christian Hildebrandt and Pastor Lorenz, of whom little is recorded, were the first pastors. Mr. Henry Christman acted as the first janitor. In the year 1852, on Easter Sunday, the Rev. Jacob Werth assumed charge and preached his first sermon. He forthwith directed his attention and efforts to effect a stronger organization. He drew up a constitution and sought to promote churchliness and good order. The signers of this constitution included Henry Oswald, Jacob Schiek, Heinrich Ziegler, Jacob Dreisinger, Konrad Oswald, George Ziegler, Jacob Oswald, Friedrich Groz, Johannes Ott, Heinrich Steffler, Adam Dreisinger, Adam Weismuller, Johannes Gross, Conrad Groz, Michael Mattusch, Sanuel Lorch, Johannes Muller, George Wettlaufer, Michael Ziegler, Heinrich Maeder, Johann Hauk, Johannes Ruggel, Karl Lorch Peter Beisel, Jacob Gabel, Adam Ludwig, Henry Koch and Conrad Kuhl. His parish records are very complete, according to which his first baptism was that of George Stroh, son of Mr. and Mrs. Conrad Stroh, born on October 1, 1852, and baptized April 10, 1853. During his pastorate he lived near St. Jacobs from where he ministered to a few scattered Lutherans in Conestogo, building a church at that place in 1853. It may be of interest to note that this pastor was also a manufacturer of Coffee Extract which was used extensively at that time. The congregation at the close of his ministry numbered 52 members. After Pastor Werth’s departure in 1859 a call was extended to Rev. H. W. H. Wichman who was serving a small congregation at Floradale. However his ministry in Elmira was brief, extending only eighteen months. It was during his pastorate that the peace and harmony of this infant congregation was severely disturbed. Strife and dissension arose; so bitter was the feeling and so grave did the situation become that one faction consisting of 22 families severed their connections from the congregation and affiliated themselves to another Lutheran group forming the congregation of the Missouri Synod. So that from now on two Lutheran congregations existed in Elmira. After this disruption the Rev. Wichman resigned as pastor in 1860. The Rev. C. F. A. Kaessman of Berlin (Kitchener) succeeded Wichman in 1861. Although he did not reside in Elmira, yet his ministry was quite effective. He guided the affairs of this small congregation for six years. During this time he kindled new hope in the hearts of the discouraged people. Members of the congregation were required to take their turns in conveying the pastor to and from Berlin for every Sunday service, which was done not by a modern streamline automobile but by a horse-drawn vehicle. This arrangement, however, proved to be rather unsatisfactory. Upon his resignation in 1867 the congregation, realizing the advantages of having a resident pastor, decided to call one who would reside in their midst. Rev. J. L. Raw of Sebastopol became the next pastor. He moved to this district on April 16, 1868. Ten days after his arrival he was installed by Pastor C. F. A. Kaessman, his predecessor, assisted by the Rev. D. Stahlschmidt of Heidelberg. His ministry although quite brief, was very fruitful. He also served the congregation at St. Jacobs, the St. Paul’s Church on the Guelph Road approximately two and one half miles from Elmira, better known as “The Oswald Church, and Bridgeport. The cost of the material and labour of the new structure was $1,700.00. Soon after the completion of the church building, Pastor Raw resigned on October 16, 1870 and accepted a call to Greenwood, Michigan. So once again the flock was without a shepherd. Upon the resignation of Rev. 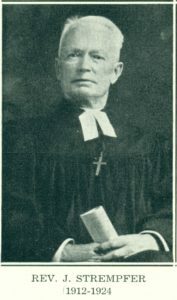 J. L. Raw, Rev. J. Salinger of Ellice was called to the congregation. Pastor Salinger was a gifted musician. He loved music. He organized the first mixed choir, and it is said that he used a violin to give the starting notes to the choir. Soon after assuming charge of this parish, which included St. Jacobs and Conestogo, plans were made to raise funds for a pipe organ. In 1875 a modern pipe organ with 12 sound registers was installed at a cost of $1,200.00. It was a tracker organ, and during its early years was pumped manually until an electric motor was installed. The installation of the organ made it necessary to enlarge the front of the church. (According to Historical Records from 1911, an addition was built to accommodate the organ but also added classroom space.) 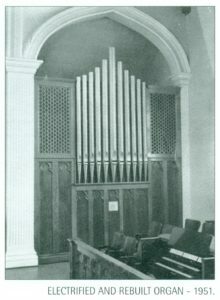 This pipe organ was constructed by the late George Vogt of Elmira who was a noted organ builder. Some of his organs are still in use today in various churches throughout the province. Mr Augustus S. Vogt, son of the organ builder, and founder of the Mendelsohn Choir of Toronto, began his musical career as the first organist of the new instrument, which was installed at a cost of $1,200.00. One of the interesting features in connection with the dedication of the organ which took place in November, 1875 was the participation of the choir of Normanby under the leadership of Andrew Rahn, who travelled by wagon to Elmira to take part in the service. Under Rev. Salinger’s supervision the choir was organized. In 1876 Rev. Salinger resigned, moving to Wisconsin. After a vacancy of six months a call was extended to the Rev. L. W. Warnke of Wallace. At this time the Parish consisted of the congregations at Elmira, St. Jacobs and Bridgeport. Due to various dissensions, which arose among the flock, Pastor Warnke’s ministry was of a short duration. In October, 1878, he resigned to take charge of the congregation in Hamilton. one weighing 600 pounds, and the other 400 pounds, were placed in the tower of the church. These bells were dedicated on April 5, 1882, by the Rev. A. R. Schulz, assisted by Rev. U. Berner of New Dundee and Rev. J. Brezing of Heidelberg. From the time of the organization of the congregation in 1850, the plot of land at the rear of the church was used as the burial ground. In 1884 the congregation began negotiations with Mr. C. Weidenhammer for the purchase of one-half acre of land on the Guelph road near the town limits, for a cemetery. This land was purchased at a price of $150.00. By 1910 more land was required and another acre was purchased from Mr. Charles Stroh. Pastor Schulz also served St. Jacobs and Bridgeport. In 1883 on account of distance, he reliquished his duties at the latter place. From 1889 – 1899 he ministered to St. Peter’s congregation at Linwood. In 1905 the St. James congregation, which increased in numbers steadily was now no more a child, decided it could financially support its own minister. Consequently Pastor Schultz resigned at St. Jacobs and ever since, the Pastor in Elmira devoted his full time to the one congregation. Rarely can pastors be had who possess such a combination of gifts and talents as Pastor Schulz. He is remembered as a faithful pastor, an efficient teacher, and an accomplished musician. During his ministry here he acted as choir leader and organist at various intervals, and gave instruction in music. Early in the beginning of this century a number of devoted women whose hearts were filled with a fervent love to serve, and realizing there was noble work for them to do in the church, under the guidance of Rev. A. Schulz, organized a Ladies’ Aid. 28 ladies gathered in the schoolroom of the church on May 1st, 1901, and became charter members of this society with Mrs. H. Gibson as the first President and Mrs. B. Wahl as the first Treasurer. As the name would indicate, this organization was brought into being for the purpose of assisting the congregation locally and the Church at large. It has truly lived up to its name. It would be practically impossible to make mention of all the contributions made and the services rendered by this organization. Besides decorating the altar, visiting the sick and shut-ins, welcoming strangers, doing charity work, this society has presented the congregation with handsome gifts and improved the furnishings within the church from time to time. Soon after its organization an exquisite chandelier, at a cost of $300.00 was purchased for the church. New pews were also installed in the old church. In May, 1901, under his direction, the Ladies’ Aid was organized and the following year a Young People’s Society was brought into existence. After thirty-two years of faithful and fruitful service in the vineyard of the Lord, he was suddenly removed unto the Church Triumphant in November, 1911. His mortal remains rest in our cemetery. After the death of Pastor Schultz in November 1911, the Rev. J. Strempfer of Toledo was called. He was installed by the Rev. A. Blunck of Milverton on Sunday, March 17, 1912. This period in the town’s history was marked by rapid growth and large increases in population. New factories sprang up, many new homes were erected and Elmira developed from a village into a town. With the growth of the town, the congregation also grew. The white brick church proved to be too small on many occasions to meet the requirements. The congregation outgrew the church. Thus on January 1, 1914, preliminary steps were instituted to undertake a building program. After careful consideration the majority of the members favoured the erection of a new structure. The Building committee consisted of: George Steffler, Charles Herman, Martin Brubacher, Karl Weber, Adam Mattusch and the members of the Church Council, namely: George Jung, John Klinck, Henry Ahrens, Henry Lackner, Albert Lorch, Christian Esch, Henry Cress, C. Klinck, Henry Beckner and Rev. J. Stempfer. Building materials, including sand, gravel and brick were hauled to the grounds before the breaking up of winter. On April 26th of the same year the last service was held in the white brick church. On the following day wrecking operations of the old church began. The excavation for the new church was done by the rural and urban members without remuneration. On July 12th, 1914, the corner stone was laid. Pastors Hansen and Behrens assisted Rev. J. Stempfer in the ceremony; the Elmira band furnished special music. On November 29th the building was so far advanced that Divine services were held in the basement of the new structure, where the congregation worshipped until the spring of the following year. The Vogt organ was moved from the old building to the new one. It was installed in the right front corner, with a choir loft in front. 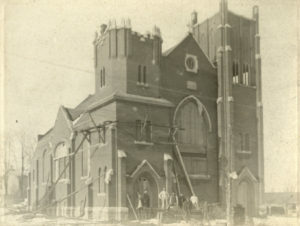 On May 9, 1915, the present church, which cost approximately $28,000.00 was set aside and consecrated as a House of God in the presence of about one thousand people. Pastors E. Hoffman, D. D. C. Zarnke, E. Bockelman, Hansen, J. Reble, Kennerly, and Voelker assisted the local pastor. Choirs from Waterloo, Kitchener, New Hamburg, St. Jacobs and Elmira enhanced the beauty of the services with special anthems. The offering amounted to $350.00. When the present church was erected, the members of the Ladies’ Aid raised funds for a memorial window and purchased the altar and the pulpit, involving an expenditure of approximately $500.00. In 1917 English services were introduced. Professors and students of Waterloo Seminary and pastors of the neighbouring Lutheran congregations conducted these English services. During the latter part of his ministry, the Women’s Missionary Society was organized under his direction. In the spring of 1923, a Women’s Missionary Society was formed when 21 women of the congregation, who were keenly interest in mission work, assembled in the church to be address by Mrs. N. Willison. At this meeting the society was organized with Mrs. J. Klinck elected as the first President, Mrs. G. Jung as Vice-President, Mrs. Fred Rudow as Secretary, and Mrs. J. Conrad as the Treasurer. Although a comparatively small organization, it did much to promote the cause of Missions. Mission books and topics were studied at the monthly meetings and Mission Study Hours were conducted annually. At that time the executive was President, Clara Rahn; Vice-President, Mrs. W. Klinkman; Secretary, Mrs. C. Lorch; Treasurer, Mrs. W. Eifert; Pianist, Mrs. F. Rudow. All women of the congregation were invited to join this organization to further the cause of Home and Foreign Missions. Much to the regret of many members and a host of friends, Pastor Strempfer on account of old age, resigned on January 13, 1924, serving the congregation until October of the same year. The congregation in appreciation of his faithful services presented Pastor Strempfer with a substantial purse at a farewell gathering held on October 22nd. He moved to Denver, Colorado, were he resided for a short time after which he moved to Fort Morgan, where he again served a small congregation until a few years prior to his death which occurred on March 10, 1934. On September 14, 1924, Pastor L. H. Kalbfleisch, of Brantford, was called to guide the affairs of the congregation. He accepted the call, assuming charge on November 16, 1924. Rev. 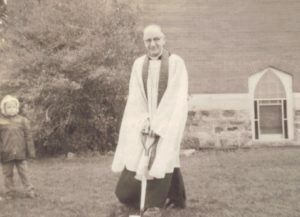 O. C. D. Klaehn, at that time President of the Canada Synod, conducted the installation service, basing his sermon on 2 Cor. 6:4. Within a few months after his installation, a drive was launched to wipe off the indebtedness of the church which was $1,500.00. The results of the campaign were most gratifying. At the time when the congregation celebrated the Tenth Anniversary of the dedication of the new Church, May 10th, 1925, $1,974.00 had been raised: the debt was wiped off on the same day. Drs. O. C. D. Klaehn and A. A. Zinck were the Anniversary preachers. 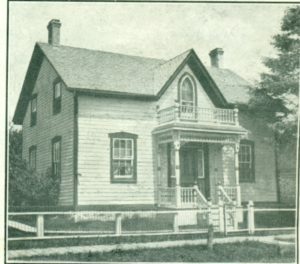 In January 1926, the congregation decided to sell the old parsonage, located on 66 Arthur Street South, and erect a modern one for its pastor on the lot adjoining the church. Mr. Henry Ahrens purchased the old parsonage which served as a home for the pastors for forty-seven years. 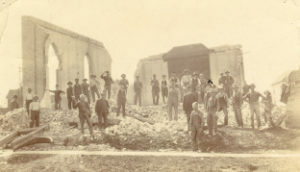 The building committee consisted of: Messrs. Charles Herman, George Herman, Henry Conrad, Henry Lackner, Henry Ahrens, Jacob Brown and the Church Council, namely: Henry Klinck, George Miller, Fred Rudow, Louis Doerfler, Albert Lorch, Josiah Schmitt, William Rahn, John C. Allemang, William H. Schneider and the pastor. The new parsonage which cost approximately $7,000.00 was completed at the end of August, being formally opened on September 1st, 1926. In 1926, the Ladies’ Aid – the Women’s Missionary Society provided an electric stove and blinds for the new parsonage. New altar and pulpit vestments to conform with the seasons of the church year were introduced by them. The ladies also made it possible for the congregation to liquidate the debt on the parsonage by approximately $2,000.00. During the same year the choir was vested, the new gowns costing more than $250.00. In 1929 extensive improvements were made to the church grounds, involving an expenditure of a few hundred dollars, which was financed by the Luther League. In the same year at the annual meeting of the congregation a Perpetual Maintenance Fund for the cemetery was created. A Brotherhood was also organized during the course of the same year. In 1928, there was a strong desire among the loyal men of the congregation for a men’s organization in the Church. A preliminary meeting, with the thought in mind of organizing a Brotherhood, was held on November 2nd, 1928, at which Dr. Kapp, Executive Secretary of the Brotherhood of the United Lutheran Church in America, was present, and at which meeting arrangements were made for the organization of a local Brotherhood. On January 28th, 1929, the organization was effected with 21 members, Mr. H. Ahrens serving as the first President, Henry Conrad as the Vice-President, H. Dreisinger as the Secretary, and Henry Cress as the Treasurer. Meetings were held monthly with discussion topics taking place. On May 11th, 1930, special Anniversary and Re-union services were conducted. Pastor Strempfer of Fort Morgan, Colorado; Rev. J. Reble and Rev. J Kirchhofer were the guest preachers. Hundreds of people from this district turned out for these services. During the year 1931 efforts were directed towards the improvement of the cemetery. New fences, and an appropriate gateway were erected, the driveway extended and the entire grounds were levelled. On November 25th, 1931, our local Seminary Auxiliary was organized with Mrs. W. Klinck as the first President, for the purpose of assisting the general Auxiliary of Waterloo Seminary. Funds are raised by voluntary offerings from the ladies of the congregation. The present officers are: President, Mrs. L. H. Kalbfleisch; Vice-President, Mrs. O. C. Weppler; Secretary-Treasurer, Mrs. Wilfred Klinkman. The prosperous years of 1921-1929, were followed by several years of severe depression. Economic and industrial conditions became very acute. Unemployment and hardships prevailed almost everywhere throughout the world. The impact of the depression was keenly felt by everyone and particularly by the members of St. James’, due to the closing of a large rubber industry in the town of Elmira. But in spite of these adverse economic conditions, by the grace of God, the congregation was able not only to meet its current expenses and contribute generously toward the benevolent causes of the church at large, but also to reduce substantially its indebtedness on the parsonage year after year. Hitherto the congregation was the recipient of numerous gifts, but never before was St. James’ Congregation remembered in a will by one of its members. Mrs. Mary Schweitzer who entered into Life eternal June 10th, 1934, at the age of seventy-one, willed that the largest portion of her estate should be used for the benefit of the Church and the Seminary at Waterloo, so our congregation became the beneficiary of a neat sum of money. English services were introduced every second Sunday morning in January, 1935, at which time also an Organ Fund was created. On May 12th, 1935, the congregation observed the 85th Anniversary of its organization and the 20th Anniversary of the dedication of the new church with special festival services, the Rev. R. B. Geelhaar and Dr. John Schmieder being the guest speakers. On the following day an organization and community evening was held, at which the neighbouring pastors spoke briefly. An elaborate Anniversary booklet was published by the pastor commemorating this memorable event. By 1935, the Brotherhood had organized the Male Choir and financed the parish paper. They financed the church paper entirely until September 1946. The executive in 1935 were C. Heipel (Pres. ), O. C. Weppler (Vice-Pres. ), W. Lorch (Sec. ), and Henry Cress (Treas.). It continued holding month meetings until February 1950. 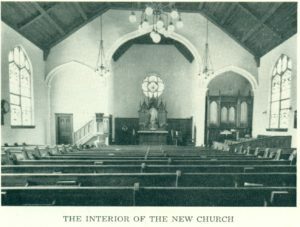 During the course of 1936 the interior of the church was re-decorated and the Junior Choir, under the supervision of the Pastor, was organized with Mr. William Keil as the first director. Shortly after our country had emerged from the severe economic depression, it was plunged into a terrible conflict which lasted almost six years. It was the most destructive conflict ever waged, fought with a fury and a madness unprecedented, involving the major powers of the entire world, causing indescribable distress and misery, disturbing and reaching every phase of life, economic, political, moral and spiritual. Immediately after the outbreak of World War II, the use of the German language at all services was discontinued. On September 21st and 22nd, 1939, the Women’s Missionary Society of the Canada Synod held its annual convention in our midst. Early in the year the Children of the Church was organized under the Pastor’s direction with more than 30 members and with Miss Clara Rahn, Miss Barbara Reinhart and Mrs. L. H. Kalbfleisch as leaders. On May 12th to 16th, 1940, successful Anniversary Services were conducted in observance of the 25th Anniversary of the dedication of the present church and the 90th Anniversary of the organization of the congregation. The Rev. C. S. Roberts and Rev. A. Jacobi were the guest speakers at the Sunday services, and the neighbouring pastors at the Rallies held during the week. During the last decade, the congregation effected many improvements on its property, of which it has always been proud. In 1941 a new heating system (forced air) was installed in the church at a cost of $1,225.00. 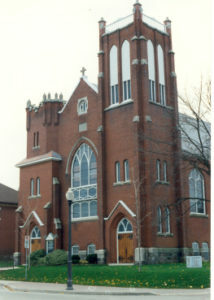 During the following year outer glass windows were installed on the church at a cost of $590.00. The chancel floor was recovered and a new broadloom rug purchased by the Ladies’ Aid in loving memory of Mr. Henry Holzschuh, who bequeathed $200.00 to the congregation and $100.00 to the Ladies’ Aid and $400.00 for the work of the church at large. This Ladies’ Aid, during the past decade, has been particularly active and has also enjoyed marked growth in membership. In 1942, this society recovered the floor in the chancel and purchased a new broadloom rug, at a cost of $275.00. The rug is in memory of the late Mr. Henry Holzschuh, who remembered this organization in his will. In the year following, the Aid, with the assistance of the Sunday School, purchased a re-conditioned Heintzman piano at a cost of $300.00 for use in the Sunday School auditorium. In 1945 this Society purchased 100 folding chairs at a cost of $285.00, while the congregation purchased a similar number. In the following year a new cupboard in the kitchen of the church was installed, and the kitchen redecorated at a cost of $227.00. In 1947, an electric stove was purchased and installed in the church kitchen, costing $138.00. In 1948, inlaid linoleum was installed on the platform in the Sunday School auditorium, at a cost of $161.00. In 1949, the parsonage kitchen was remodelled at a cost of $500.00. On May 13th – 15th, 1945, most impressive Anniversary Services were held which marked the 30th Anniversary of the dedication of the present church and the 95th Anniversary of the organization of the congregation. Rev. A. Lotz and Dr. H. T. Lehmann, President of Waterloo College and Seminary, were the guest speakers at the Sunday services. During the same year folding chairs were purchased for the Sunday School auditorium, the church was insulated and a new furnace installed in the parsonage. During the period of World War II, the Ladies’ Aid remembered the boys overseas frequently and also was active in Red Cross work. Since the close of the war, an active part in European Relief work was taken. The Welcome Home and Thanksgiving Supper tendered by our ladies on May 29th, 1946, in honour of the 54 members of our congregation who served in the Armed Forces during World War II, will long be remembered. Two of the men, viz. Albert E. Atkinson and Edward O’Krafka paid the supreme sacrifice, while four were wounded. Among the activities for the church at large, mention should be made of the annual maintenance of a Bible Woman in India, and the furnishing of a room in our Seminary at Waterloo. The improvements effected during 1947 included the purchase of an electric stove for the church kitchen by the Ladies’ Aid, and a new Gestetner mimeograph acquired for the publication of our Bi-weekly Bulletin. 1 pair Brass Candelabra in loving memory of Miss Mary Ludwig and Miss A. Zillax. 1 pair of Brass Altar Vases in loving memory of H. W. Zilliax. 1 Brass Receiving Basin in loving memory of Mrs. Jacob Foerster, and 1 solid Oak Credence Bracket. Early in the year a generous bequest of $500.00 from the estate of the late Louis Doerfler was received for the Organ Fund. Waterloo Seminary also became the beneficiary of $500.00. During 1948 efforts were directed towards the improvement of the basement which included re-wiring and re-decorating at a cost of $950.00 and the installation of floor covering and refinishing of the entire floor at a cost of $225.00. On December 5th two solid oak chancel tables were dedicated in loving memory of the late Mr. John Gromeder. Willing members opened their hearts and homes to entertain the 86th Annual Convention of the Evangelical Lutheran Synod of Canada, which assembled in Elmira on June 8th – 11th, 1948. The 145 pastors and laymen who attended will long remember the kind hospitality tendered and the splendid meals served by our ladies. On various occasions the congregation manifested its appreciation and goodwill towards its Pastor and his wife. On June 5th, 1948, a special service arranged by the Church Council was held in honour of the 25th Anniversary of the Pastor`s ordination at which Dr. J. Reble was the guest speaker. Several presentations were made at this occasion. Only a few months later, on November 15th, the congregation tendered a dinner in honour of the Pastor and his wife who observed their Silver Wedding Anniversary and presented them with a beautiful Silver Tea Service. 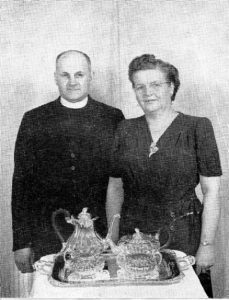 On November 16th, 1949, another dinner was tendered commemorating 25 years of the Pastor`s ministry in Elmira, on which occasion the Pastor and his wife were presented with a beautiful Westminster Chime Clock. In the spring of 1949 the interior of the church was re-decorated and the exterior woodwork repainted at a cost $1,200.00 A baptismal Ewer was also dedicated in memory of Oswald Marschall. The congregation received a bequest of $200.00 from the Elizabeth Robertson estate, of which $100.00 was for the Organ Fund and $100.00 for the Cemetery Fund. The kitchen in the parsonage was also remodelled at a cost of $500.00 financed by the Ladies’ Aid. September 28th, our ladies entertained the largest Ladies’ Aid Rally ever conducted in the history of the Canada Synod. 740 ladies attended. On December 18th, a Tower Chimes Amplification System, which was installed at a cost of $925.00, was dedicated as a memorial in loving memory of the late Mr. And Mrs. Henry J. Gibson. This Amplification System was a gift of their children, namely: Byrie H. Gibson, Dr. C. E. Gibson and Irene J. Woodhull. Our congregation is not only interested in its local needs, but also in the work of the church at large. Since 1940 the congregation met all its quotas for Apportionment, Lutheran World Action, and Waterloo College Expansion Program. Due to the faithful services of our Church Paper Representative, Mr. Henry Ahrens, this congregation has now 66 subscribers to the Lutheran and 99 to the Canada Lutheran, which is commendable. These papers in addition to the Parish Bulletin are potent agents in stimulating interest and keeping members informed. Celebrations commemorating the centennial of St. James Congregation and the 35th anniversary of the present church building commenced on May 7, 1950 with a Festival Service. Dr. John H. Reble, President of the Evangelical Lutheran Synod of Canada, was the guest preacher. The evening anniversary service was addressed by Rev. S. J. Wittig, Pastor of St. Matthew’s Lutheran Church, Hanover. The rest of the week included a Youth Rally, a Ladies’ Rally, and a Community and Fellowship Service. The latter event was addressed by ministers from other churches in Elmira. The congregation during the long years of its history has given two sons to the Holy Ministry namely, Rev. Emanuel Schulz, deceased, and the Rev. J. Oscar Neeb, Buffalo, N.Y. and is now looking forward with great joy to the ordination of Student Albert Lorch who now is completing his second year at Waterloo Seminary. 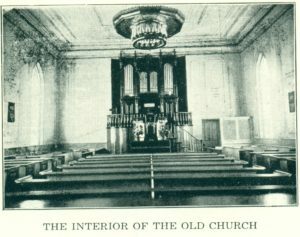 For some time many members of the congregation were of the opinion that the present organ had served its purpose and should be replaced by a modern one. Thus, at a special meeting of the congregation held on February 26th, 1950, the congregation unanimously decided to purchase a new pipe organ as a project for 1950. A committee consisting of Herb. Cress, William Brown, Vera Rahn, Henry Soehner and Charles Lorch was appointed to work in conjunction with the Pastor and the Church Council. The Keates pipe organ was dedicated at the morning service on Sunday, June 24, 1951. Pastor L. H. Kalbfleisch returned to preach the sermon, and the address was given by Dr. Ulrich S. Leupold of the Seminary. Dr. Leupold also played the organ. That evening an organ recital took place, featuring the musical talents of Howard Kew of London, Ontario, as well as singing by Mrs. Beatrice Krupp and the Elmira Girls’ Grad Choir, under the direction of Claude Chislett. Dr. John H. Reble, President of the Canada Synod, delivered the address. As we glance over the history of our congregation at this the 100th Anniversary of its organization and the 35th Anniversary of the dedication of the present church, although it is fraught with sacrifice, we are reminded of the boundless Goodness and the manifold Mercies of God. His loving kindness and guiding hand always rested upon us. In times of difficulties and troubles, in days of trial and adversity, He proved to be our Guide and Strength. Even although we were unworthy, He did not forsake us. Thus, with deep gratitude to God and with humble hearts, let us glory not in our achievements but rather glory in God for what He has done for us through Jesus Christ, our Lord, and begin another century in the congregation’s history, confidently trusting in God as to the future and heroically pressing on to promote His Kingdom on earth. Although records are not complete, nevertheless, they indicate that 1,324 children were baptized, 968 children and adults were confirmed, 420 couples were united in Holy Wedlock and 516 funerals were conducted, during the 100 years of the congregation’s existence. In 1950, after 27 years of service, Pastor Kalbfleish resigned to accept a call to the Sullivan-Williamsford parish. In September 1951, the Rev. Harry W. Baetz became the new pastor of St. James, coming from St. Mark’s in Chesley. In the era following, there continued to be many changes and much growth. 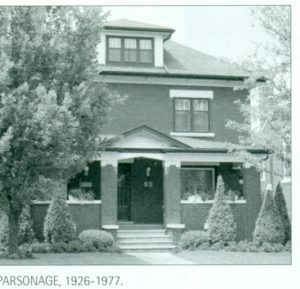 There were extensive renovations done in the parsonage in 1953. Then in 1954 the interior of the church was renovated. It was soon apparent that the present building, which was now 50 years old, was no longer adequate for the complete program carried on by St. James. The seating arrangement was changed to permit a centre aisle. New flooring was laid, and the paneling around the chancel was extended. The church was completely rewired and cathedral lights were installed. Also a sanctuary lamp was donated and a beautiful 25 tone set of Maas Chimes were received. In March 1957, the women were known locally as the St. James Women’s Missionary Society but in the wider church they were known as the United Lutheran Church Women. In 1959 the women’s groups of St. James were known by one name, St. James Women of the Church. The birthday of Lutheran Church Women in America (LCW) was January 1, 1963. Some of our conventions were in Washington, DC and Atlanta, Georgia. Presidents in the early 60’s were Joyce Strebel and Betty Gingrich. On Reformation Day, October 28, 1962, the first sod was turned. Rev. Baetz conducted the ceremony, and representatives of all church auxiliaries, as well as other members, young and old, participated. Two days before Christmas, the cornerstone was laid, and work on the projects continued satisfactorily throughout the winter months. On Pentecost Sunday, June 2, 1963, in the afternoon, dedication services for the new Educational Unit and Church House were held. The guest preacher was Dr. Albert W. Lotz, President of the Eastern Canada Synod. The Elmira Signet reported that there was “an overflow crowd, many listening through the PA system.” During the rest of the week three special services were held: the Women of the Church Service, with former pastor, Lloyd Kalbfleisch preaching; the Loyals Service, with Rev. Adolph Kappes, of Conestogo; and the Luther League Service, with Rev. Henry Fischer, from St. John’s Lutheran Church, Waterloo. Until the 1960s, the Lutheran Church did not ordain women, and the St. James Church Council was made up entirely of men. Annual meetings were attended only by men. By the late 1960s, women started to be ordained, and the first female member of the Church Council, Alma Dreisinger, was elected in 1968. Since that time, several women have been chairpersons of our Church Council, including Verneda Prentice, Cynthia Hastings, Ann Reid, Brenda Schott and Barb Wilkie.. The congregation decided to put an addition to the present structure to include a Christian Education wing and a fellowship hall. The addition cost approximately $120,000 and was dedicated to the glory of God in June of 1963. In August 1972, Pastor Baetz resigned his duties as pastor, and retired. In Sept. 1972, the Rev. Howard Guse became pastor of St. James. 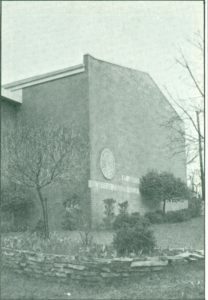 By 1974, fifteen years after the Educational Unit (Fellowship Hall) was proposed, St. James had raised enough money to pay for the new facilities. A special “Service of Thanksgiving on the Retirement of an Indebtedness” was held on Sunday, February 24, 1974. Former Pastor Harry Baetz participated in the service, and the message was delivered by Dr. Otto F. Reble, President of the Eastern Canada Synod, Lutheran Church in America. Special music was provided by the combined choirs of St. Paul’s Lutheran Church, Elmira; St. James Lutheran Church, St. Jacobs; and St. James, Elmira. The debt of the parish hall was retired just 12 years after it was built. The previous week, the congregation voted to purchase a new organ from the Schlicker Organ Co. in Buffalo N. Y. at a cost of about $36,000. This was to be a two-manual, nine-rank instrument, installed in the gallery. Brown Brothers of the congregation built some of the case work, with the balance of the organ coming from Buffalo. The old organ was sold. 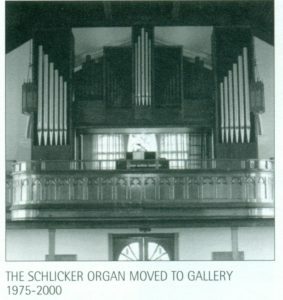 The Schlicker organ was dedicated at the morning service on Transfiguration Sunday, February 9, 1975. The service was addressed by Rev. Eric Weber, assistant to the president of the Eastern Canada Synod, and included the participation of members of the Organ Committee, as well as the choirs of St. Paul’s Lutheran Church, Elmira; St. James, St. Jacobs; and St. James, Elmira, under the direction of Organist and Choirmaster, Ken Seiling. That evening, a Choral Evensong featured the Choral Choir of St. John’s School, Elora, under the direction of Mark McDowell. All the physical developments did not overshadow other avenues of service for St. James. In January and April 1972 an invitation for a “Get Acquained” coffee hour was extended to young women of the congregation. From this developed the Fellowship Coffee Hour, later to be called the Fellowship Group. They met once a month in a morning and evening group. Later baby sitters were provided by our women. They had speakers did crafts and enjoyed a variety of topics. This group disbanded in November 1980. 1974 marked the thirty-fifth year in a row that St. James met and surpassed its obligations to the mission work of our church at large by meeting its apportionment. The congregation also continued to grow numerically and had 655 baptized members of which 480 were confirmed. 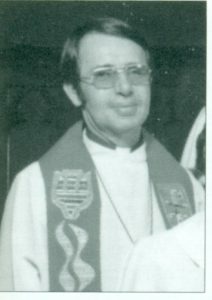 On Sunday, May 11, 1975, St. James commemorated the 125th anniversary of the congregation with a morning service that was attended by Dr. Otto Reble, President of the Eastern Canada Synod. The celebrations continued in the evening with a choral service that included the choir of St. John’s Lutheran Church in Waterloo. In 1977, at the request of Pastor Guse to buy his own home, the church parsonage, beside the church, was sold to Dreisinger’s Funeral Home for $40,000, but the use of the adjoining parking lot was retained for the use of the congregation. Because of a desire of the people in the Fergus/Elora area for a Lutheran church there, in 1980 the congregation sponsored a mission congregation, later to be known as Faith Lutheran Church. 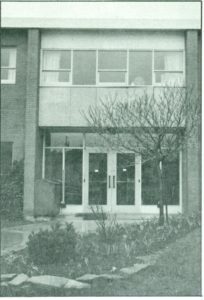 St. James Manor (8 Dunke Street North, Elmira), a residence for seniors, was dedicated in the summer of 1983. The start-up money for this project came from a bequest from Cranson Brubacher in the 1970’s. 28 apartment units were built with the approval of and in partnership with Canadian Mortgage and Housing Corporation. Although initiated by St. James as an investment in the community, the complex is non-denominational and is operated by a volunteer board of directors from the community. Ron Lorch is presently the only original member still serving on this board. The constituting convention for Evangelical Lutheran Women (ELW) was held June 27 – 30, 1985, in Winnipeg, Manitoba. This was the beginning of the Canadian group. Grace Feick was a delegate and Erma Wagner a visitor to that convention. The theme was “One in Christ, One in Ministry”. Mary Brown and Freda Brubacher were president and vice-president at this time. The Rev. Howard Guse resigned as pastor in 1985 to enter Chaplaincy ministry. The congregation called Pastor Norm Robertson, who arrived later that same year. During his short tenure, the life of the congregation flourished. But then again in 1986, during the pastorate of Norman Robertson, the men of St. James decided to have a “Men’s Group”. In October of that year, the “ELM” (Evangelical Lutheran Men) first met. Their goal was to provide a four pronged service to the congregation. They wished to be of service to seniors, be of service to youth, assist with building improvements and host special events. Although many of their members do fulfill these goals, it is with other groups within the congregation that they serve. The meetings have developed the pattern of first having dinner, and then a presentation and discussion or social evening. It was proposed, and continued that they have nine monthly meetings during the year. The founding executive committee was Paul Hoffer, Bill Otto, David Gingrich, Murray Hill, Jack Bartholomew, Murray Heimpel, Harold Reger, Ron Bock and Pastor Norm. The Evangelical Lutheran Men (ELM) was begun, and studies were done regarding the installation of a hydraulic lift for the benefit of any handicapped members and visitors. Pastor Robertson resigned in 1987, to pursue another career. The congregation called Pastor Donald Stroh as our new spiritual leader, and he arrived later that same year. On May 7, 1989, the congregation decided to proceed with a building program to include a new side entrance, and Pastor’s office were built, along with the hydraulic lift to give disabled people access to each level of the church at a cost of $232,373.. The building project was completed by that fall, and the lift was dedicated on November 26, 1989 (Christ the King Sunday). Council Chairperson, Verneda Prentice, cut the ribbon, and a representative of the contractors, Bradford Construction Company, presented the key for the renovated side entrance to Ron Bock, the Building Chairperson. Guest preacher was Arnold Weigel, a professor at the Seminary, and guest soloist was Ross Heimpel of Stratford. Mayor Bob Waters and architect Don Snider brought greetings. This gave access for the handicapped to four levels in the church building – basement/Sunday School level, side entrance level, second floor office level, as well as the church sanctuary itself. The Lift Project Committee consisted of Chairman Ron Bock, Earl Horst, Ken Woods, Ken Seiling, Lorne Feick, Bob Ward, Audrey Schaner and Norma Snyder. On May 13, 1990, a service was held to celebrate 140 years of God’s blessings upon St. James congregation, as well as the 75th anniversary of the present church building. The sermon was delivered by Bishop William Huras of the Eastern Synod, Evangelical Lutheran Church in Canada. Special guests included Pastor Albert Lorch, a son of St. James; Mrs. Lloyd Kalbfleisch, the wife of a former pastor; and former interns Lowell Nussey, Ralph Dwarika and Shirley Ruller. The service was followed by a dinner in the Fellowship Hall. Later that year, on December 2, the many talents of our members, young and old, were on display at an Anniversary Talent Night. Ken Douglas served as Master of Ceremonies. A new logo was designed by Paul Stewart, son of a former member, incorporating a drawing of the exterior of the building, and St. James’ coat of arms. A Service of Thanksgiving for the Repayment of the Building/Lift debt was held on March 10, 1991 (Fourth Sunday in Lent). In 1995, our 145th Anniversary year, after a caring and active ministry Pastor Stroh retired, and resigned. Once again, the congregation search for a replacement, and that same year Pastor Wendell Grahlman accepted the call in 1995 and was installed. In the course of his ministry, several things were accomplished – a new roof for the educational wing, renovations and painting in the Chancel area, a free standing altar, purchase of supplemental hymn books, etc. In 1999 the parking lot, next to Dreisinger’s Funeral Home, was sold to them for $90,000. In the year 2000, our 150th Anniversary year, Pastor Grahlman resigned, and we must look for his replacement. Pastor Harold Brill will fill in for 3 months and then Synod Office assigned Rev. Barry Boeckner to be our Interim Pastor for the next eighteen months. Our best wishes go with Pastor Grahlman as he moves on to his next parish in Midland. Over the years, spring and fall quilting bees have produced hundreds of quilts. Some of these were donated to seminarians as they graduated while the bulk were donated to relief work. The women’s group has continued to hold month meetings with programs, visit the sick and shut-ins, visit older members on their birthdays, collect for the Seminary Auxiliary, serve funeral and congregational luncheons, collect and send Layettes and Kits, sew and donate quilts, take care of the altar, cradle roll and the sending of memorial cards, care for the flower beds, and take part in the world day of prayer and the Maple Syrup Festival. They have purchased items for the kitchen and furniture for the meeting room and draperies for the church. In the year 2000 they purchased shutters at a cost of $987.00 for the pass through from the kitchen as their 150th anniversary gift to the church. Jean Adamson is president and Barbara Lichty is vice-president in the year 2000. In May 2002 St. James extended a call to Pastor Hans Borch. Pastor Hans was a recent graduate of Waterloo Lutheran Seminary. Pastor Hans’ Installation service was held Sunday September 29, 2002. Pastor Susan Johnson, Assistant to the Bishop, presided for the installation service. St. James congregation has not escaped the trend of the times, which is declining membership in most “main line” churches. As at December 2005, the baptized membership stood at 428 and communing members at 220. In 2010 St. James commemorated its 160 years as a congregation. The Anniversary Committee consisted of Barb Wilkie (Chairperson), Irene Dickau, Melissa Leis, Paul Kreller, David Reid, Gerry Wilkin and Pastor Hans Borch. April 18, 2010 was Anniversary Sunday, with Bishop Michael Pryse preaching the sermon. Although not listed in our historical books, Bishop Michael was a placement student at St. James during his time at Waterloo Lutheran Seminary. Throughout the year we enjoyed a series of concerts organized by Organist and Choir Director, Jeff Enns, assisted by the Anniversary Committee. Among the concerts was “An Afternoon of Chamber Music,” featuring Peter Carter, Jennifer Enns-Modolo and Jeff Enns.